Welcome to The Foley Food & Wine Society wine shop, where you can purchase your favorite selection of Foley Family Wines conveniently shipped in one convenient container. 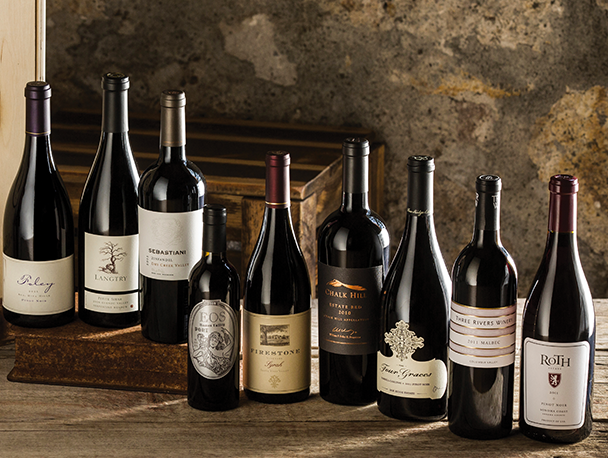 This online wine store is an exciting extension of our new Foley Food & Wine Society which was borne from Bill Foley’s desire to unite three of life’s biggest passions – world-class wines, exceptional cuisine and outstanding destinations. Beautifully balanced with a profile that is sophisticated and nuanced. Aromas of apple and pear are followed by integrated oak notes. Delicate and elegant notes of apple, lemon meringue and a kiss of vanilla. Notes of lychee, ginger, and orange blossom. The crisp palate is filled with flavors of grapefruit, lime zest and lemon. It’s balanced and refreshing nature makes it extremely food friendly. I recently held a master class at Firestone Vineyard and poured this as part of a fascinating blind tasting with “midnight” wine glasses. It was the surprise hit of the crowd! Not being able to visually comprehend the wine, but to compensate all other sensory of aromatics and palate – powerful and delicate at the same time with intense floral and spiced fruits. Strong cherry liquor and blackberry aromas followed by terroir notes of graphite and pencil shavings. A fruit-forward wine with black cherry, cassis, cigar box, and sandalwood oak on the nose. Bright and inviting with enticing aromas of gala apple, lemon and peach emerge. Flavors of fresh cut pineapple, candied pear and citrus dance on the palate. A bright acidity and a distinct minerality.